One of Deb's darling little "Belly Bears", this drummer boy is reminiscent of days gone by. It has a nostalgic flavor to it with it's highly detailed uniform and bright gold accents. 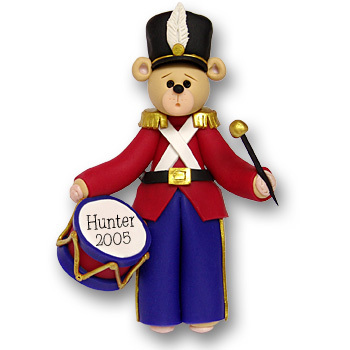 This Christmas ornament may be personalized on the drum with a name and a year. It makes a great gift for a child or a child at heart. Handmade from polymer clay and designed by Debi Allison. It comes complete with a hook and satin riboon for hanging.